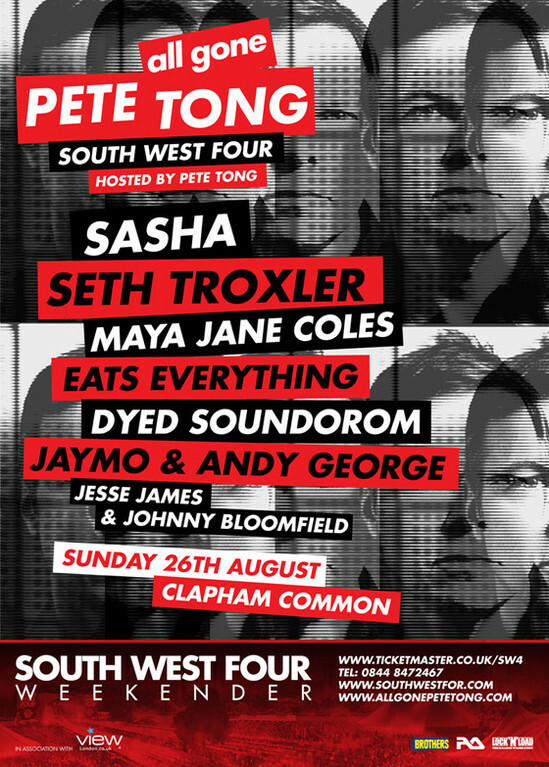 Pete Tong returns to SW4 in London this year with his ‘All Gone Pete Tong’ arena, featuring some of the best support from the world of electronic music. Joining him on Sunday 26th August are Sasha, Seth Troxler, Maya Jane Coles, Dyed Soundorom, Eats Everything and Jaymo & Andy George. Pete’s main stage outing at last year’s SW4 was followed by a headline slot at the Together Winter Music Festival. 2012 has already been a monumental year for Pete and All Gone so far, with a sell out ‘All Gone Pete Tong’ UK tour culminating in a phenomenal London warehouse party. ‘All Gone’ shows in Miami, Amsterdam and Moscow took Pete’s underground house sound farther afield, while ‘Pure Pacha All Gone Pete Tong’ is currently enjoying its second phenomenal year at Pacha, Ibiza, with guests including Jamie Jones, Seth Troxler, Calvin Harris, Sebastian Ingrosso and many more. Check our former Tune of the Day below, the cracking Tong & Rogers’ ‘Shake The Dice’, which is out now on Toolroom Records and has been getting great support by DJs such as Luciano, Dubfire, Uner, Nic Fancuilli, Joris Voorn and many more.